Russia, Crimea and US - The Second Cold War? It’s the second Cold War! We’re on the verge of World War III! Putin's the new Hitler! Putin's a man of action! Obama capitulates! These are the kinds of things being bandied about in the news since Putin moved to annex Crimea. Normally this sort of sensationalism is limited to the commentary shows, but it’s found its way into the think tank coverage and news reports. The collective memory of the Cold War casts a long shadow, indeed. But with all the fuss about whether Barack Obama should stand up to Vladimir Putin and flex military might, or whether Russia has designs on taking everything up to NATO’s frontier, there has been scant coverage of why Russia has taken the actions that it has toward Ukraine and Crimea. There could be a dozen reasons or more why Putin annexed Crimea, but only one of them is a core national interest to Russia: the port at Sevastopol is Russia’s only warm water port, and without it Russia would be severed from a huge section of the world. Perhaps Russia might have been able to move its Black Sea Fleet, but that would have been a stain on Putin’s record with his domestic audiences and difficult to accomplish quickly. Sitting in the Kremlin, looking at the fury of the demonstrators in Kiev over Yanukovich’s sudden suspension of trade and association talks with the European Union, Putin and his team must have seen a narrowing window of opportunity for securing their interests in a westward drifting Ukraine. Another explanation, dealing more with national pride and domestic Russian politics, is that Ukraine’s aspirations toward a European future rather than a Russian one left a sting, and Moscow needed a counter-narrative to refocus Russians away from that sobering reality. Putin has been trying hard to entice many of the former Soviet republics into a trade area called the Eurasian Union — and it would look very bad to have Ukraine abandon Russia’s regional project. The Russian economy has been lurching along at about 1.5% GDP growth, and Russians themselves are upset with Putin’s United Russia party and the Russian government’s corruption. Foreign policy gives Russia an opportunity to revive Russian memories of its centrality to global affairs and to forget about domestic problems — and in that sense, this Crimean gambit has been a resounding success. Syria, Iran, and Edward Snowden have all somehow given Russia the opportunity to frustrate the remaining superpower and be an arbiter in several of its major foreign policy priorities. These are also reasons why the United States might take an opportunity to punish and preoccupy Russia if it could, and contrary to the conventional wisdom I think that is exactly what happened here. 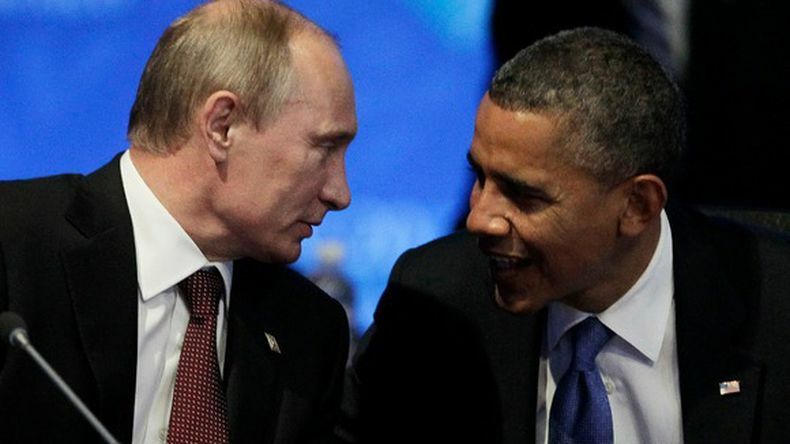 On February 28, as Putin was contemplating whether to send troops into Ukraine, President Obama gave a press conference in which he warned Russia that there would be costs for a violation of Ukrainian sovereignty. We know what happened next: Putin won parliamentary approval to invade Ukraine and he promptly went and annexed Crimea. Most commentators seem to have taken Obama’s statement literally (that he didn’t want Russia to move troops into Ukraine) rather than as a strategic communication with other goals in mind. Obama’s staff and his recent experiences with Russia would certainly have made him aware of the fact that Putin can’t be seen as bowing to American pressure, and that a statement such as the one Obama gave would prompt an opposite reaction from Russia. Putin, like all leaders, plays to a domestic audience, after all. Obama could have used a number of other warnings or expressions in his press conference. He might have asked Russia to exercise restraint, or perhaps he might have said that he was deeply concerned that Russia’s actions would alienate its neighbors, or he might have even said that Russia’s actions would initiate a chain of events that would be detrimental to Russia and beyond America’s influence or control. But that’s not what he said. He said there would be costs. Obama’s statement all but assured a Russian intervention. This isn’t Syria; there are good outcomes for the United States, Europe, and possibly even westward leaning Ukraine here. So why would Obama want Russia to involve itself directly in Crimea? The United States actually gets a lot out of this scenario. First, Russia has tried to represent itself as a protector and shepherd to aggrieved states, and this denudes that assertion. Despite recent Russian conflicts such as Chechnya and the 2008 Georgian occupation, Russia has tried making the case on Libya and Syria that no power should interfere in the affairs of another's — apparently, even if a ruler such as Bashar al-Assad seems to believe that sovereignty translates into a right to perpetrate large scale atrocities on his own people. This incident with Ukraine is a reminder to foreign audiences that Russia is hardly a sincere spokesperson for non-intervention. Suddenly a leader’s announcement that they’ll meet with Putin for high level discussions — at, say, a BRICS Summit — is likely to sound to domestic audiences less like a cool and rebellious contrarian move in the age of Snowden’s revelations and more like the sort of thing that they’ll want to be briefer and less public about. Second, this keeps Moscow busy for a while, and the United States has a history of tricking Russia into long and protracted conflicts in its own neighborhood. Because of the port in Sevastopol, it was likely that Moscow would be deeply engaged in Ukrainian politics and would attempt to influence outcomes anyway. This is still likely to be a mainstay of Russian-Ukrainian relations, but rather than having a need-to-have component to the relationship (a sympathetic Ukrainian government for a core Russian national interest in its Sevastopol port), they’ll instead want to have a government with convergent interests for things such as its existing natural gas pipelines. But even here, Russia may end up losing more than it gains, as the European Union thinks about how to mitigate risks in energy dependence on Russia, particularly as future energy exports from the United States increase. Russia’s behavior is almost certain to push Ukraine even faster into the arms of the European Union, and the clear severance of Crimea from Ukraine allows Ukraine to do so with more political energy from the major regional powers. Third, to the degree that the United States wants more energetic European cooperation or NATO enlargement or justification for missile defense or other military installations (even if just as bargaining chips), the US will probably have them. Why would Europe not be opposed to the events that have transpired? Europeans have long bemoaned America’s shifting focus to Asia, which predates the Asian "rebalance.” Now they are the center of American attention and this will have positive implications for a variety of US and EU initiatives, not the least of which is the major trade agreement presently under discussion, the Transatlantic Trade and Investment Partnership (TTIP). Europe would eventually have had this agreement in any case, but Russia’s behavior increases the likelihood of a faster-paced discussion, decreased countervailing pressure from Republicans in Congress and key members of Obama’s own party, and finally whether gas exports from the US to Europe materialize in any meaningful way, the Europeans are now able to bargain harder with Russia. Could President Obama and his staff have foreseen or planned for all of these things beforehand? Certainly not. But it was clear even as events were unfolding that Putin was choosing not based on preference and freedom to act, but rather out of a very limited set of bad options — many of which provided advantages to American interests, as long as the US and NATO understood that they would never actually be able to deter Russia from a Crimean military operation.